Home / The Game / Defense / Washington Wizards Defense: is there any good news? Washington Wizards Defense: is there any good news? Avidly watching (and blogging) the Wizards this past season, I came to the conclusion that while meaningfully improved, team defense still had a long way to go, especially in terms of guarding the perimeter. Since the end of the 07-08 season, there have been differing opinions on whether the Wizards defense had really improved from 06-07. First came the Washington Times Wizards beat writer, Mike Jones, citing a “dramatic transformation” resulting from the debut of Randy Ayers’ defensive philosophy. Jones’ main statistical argument was that the Wizards went from allowing a league worst 104.9 points per game in 06-07 to 99.2 ppg in 07-08, 12th in the NBA. Mike Jones also pointed out that the Wizards went from getting out-rebounded by 1.8 boards per game to having the edge over opponents by 0.4 rpg. What happens if this season’s Wizards played at the same pace as last season’s? Their points allowed per game would rise from 99.2 to 104.3. In other words, this “improved” defense that Jones and mainstream media are celebrating is in reality an “improvement” of just 0.6 points per game. The Pradamaster also previously covered this concept on Bullets Forever. This got me wondering…..why exactly did the Wizards play at a slower pace this past season? Could it be the result of improved defense? And how would one go about figuring this out? There had to be some good news about the D, and I wanted to find it. One traditional theory on defense hinges on shot clock usage. If you make your opponent use more of the shot clock, you are making them work harder to implement their offense. 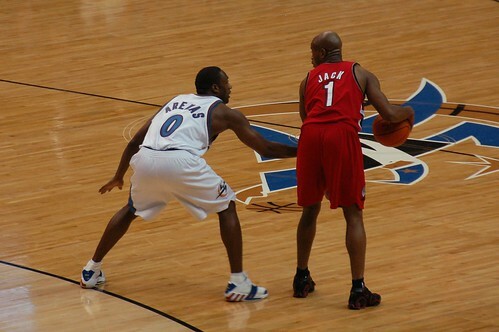 No ideal defense involves allowing your opponent to score quick baskets. I realize that the flip side of this argument is that some offenses (like the slow developing Princeton perhaps?) at times thrive on using the shot clock to wear down the opposition. The numbers, however, prove otherwise. Back to shot clock usage, where do we find it? Why, from our good friends at 82games.com. To instill that it’s better defense to make the opponent use more of the shot clock, I took the average eFG% [(FG + 0.5 * 3P) / FGA] for the Wizards defensive shot clock usage during Eddie Jordan’s five years as head coach. As you can see, the later the shot comes, the less likely it will go through the hoop. So how did the Wizards do from 06-07 to 07-08? Ehh….minimal improvement. In 06-07, 37% of opponent field goal attempts came within the first ten seconds of the shot clock, 26% within 11-15 seconds, 24% within 16-20 seconds, and 13% after 21 elapsed seconds. In 07-08 opponent attempts after 21 seconds increased by 1% (from 13% to 14%). Attempts during 0-10 and 16-20 elapsed seconds remained the same. The 1% difference came from opponents taking less attempts in the 11-15 seconds range (from 26% to 25%). What does this tell us? Attempts within the first ten seconds usually indicate a score on the break, or in early transition offense. Attempts within the 11-15 second range usually indicate the initial play or set resulting in a good attempt (before the offense breaks down and somebody goes 1-on-1). So, the Wizards did a better job at disrupting early offense and forcing the opponent to take more tough shots with the shot clock winding down, and thus slowing the game pace…….albeit, by a meager 1%. My curiosity as to if better defense slowed down the Wizards game pace (in the form of making opponents use more shot clock) was proven not to be true. The 1% change from 11-15 seconds to 21+ seconds is not significant. This only leads us to what we knew all along, that the Wizards offense, in the absence of Gilbert Arenas at the point, slowed down…..and it wasn’t necessarily a good thing as some would have you believe. Continue reading: Pace, Shot Clock Usage, and The Value of Gilbert Arenas. So did Randy Ayers make any difference? My personal observation tells me yes….but what do the stats say? 82games.com also breaks down shot attempts into four categories: Jump, Close, Dunk, and Tips (Jump is defined as 6ft. and beyond). Before Ayers came aboard the Wizards had issues with giving up too many close shot attempts. In 06-07, 26% of opponent attempts were from close range. That improved to 24% in 07-08. The difference was made up in forcing opponents to attempt 2% more jumpers than in 06-07 (67% to 69% of total attempts). Dunk attempts remained consistent at 5%, where they’ve been during each of Jordan’s five seasons. Tip shot attempts actually went down from 2% to 1% (it’s worth noting that the 07-08 figures add up to 99% as the percentages are rounded). Two percent? Big deal. Opponents attempted 6,537 shots against the Wizards in 07-08. The 2% change essentially means that the Wizards made opponents take just under 131 shots as jumpers instead of from close range. That averages out to about 1.6 attempts per game. The Wizards played in 15 one-possession games this past season (games decided by three points or less). Their record in those games was 5-10 (the Wizards were 5-0 in games decided by four points). While 1.6 doesn’t seem substantial, when you consider that an entire 48 minutes can come down to one possession, you better believe that a team will take every advantage it can get. Traditional zone defense is not is played in the NBA. When they implemented rules allowing pseudo zones in 2001-2002, many people claimed it was either because of Shaq’s dominance, or Iverson’s ball pounding, and that zone would ruin the NBA. Too bad those opponents didn’t factor in how the three second rule on defense and a more strict view on hand-checking would keep zones from slowing down the game. Zone didn’t even take away amazing individual performances from the NBA game. Rather, zone defense has improved the offensive quality of the NBA game by being conducive to ball movement and by increasing the flow to the game. We know that the Wizards often play a match-up zone, which not only helps to mask individual defensive inefficiencies, but also works to push the opponents away from the basket. As mentioned, past Wizards defensive problems involve opponents getting easy shots in the lane. Randy Ayers has altered that trend in the right direction. This is even more evident when you look at the eFG% that the Wizards have given up on close range shots. In 2006-2007, opponents shot 60.4% from close range, 61.6% during the four years prior to 07-08. This past season, that percentage improved to 58.8%; points from close range also went down by 3.3 (from 25.8 ppg to 22.5). Look, I’m not going to deny that the Wizards don’t have a laundry list of defensive issues. My #1 assertion has been that the Wizards need to acquire a lock-down perimeter defender in the off-season. They need someone to limit dribble penetration by the oppositions best creator. The match-up zone allowed the Wizards to make opponents shoot from the outside more, but assisted baskets on those jumper attempts increased from 67% (also the previous 4-year average) to 71% in 07-08. No one is pressuring the ball on the perimeter while possessing the quickness to intelligently play passing lanes and the ability to contest shots with discipline. Finally, the 2007-2008 defensive shooting stats for the Wizards are astounding. The Wizards gave up an NBA worst 38.6% on opponent 3-point shots (tied with the Pacers). The Wizards opposition also jacked treys on 27% of all attempts, an NBA high. In contrast, Wizards limited opponents to 36.7% on 2-point jumpers, second best in the NBA only to the Boston Celtics. Yet, the Wizards were tied with Philly in giving up the highest percentage of assists on 2-point jumpers at 59%. More NBA Worsts: The Wizards gave up 65.8% on inside shots. But, only 30% of opponent attempts came on inside shots, tied for 2nd lowest in the league. The Wizards did better as a team to pack in the zone and make opponents shoot worse from close range, while keeping them around the perimeter more often. That’s a tangible defensive improvement in the right direction, the result of good coaching. But to advance further, all players must progress as individual defenders. I’ll defer to the age-old adage that you can use statistics to prove anything….it’s all about how they are deciphered. In my personal translation, the coaches are pulling more than their share of the weight. It’s time to get the right personnel in place and for the returning players to show the will to play defense. The final word on Wizards defensive improvement? Let’s just say that it falls somewhere between a fallacy and dramatic, and I’m putting 60% of the weight on the side of the former. As mentioned, in looking for evidence of defensive improvement from 06-07 to 07-08, I gathered data for Eddie Jordan’s 5 years as head coach in DC. Did you know? That opponent eFG% for shots taken with three seconds or less left on the shot clock have increased each season…..by an average of 5.5%? I’ve broken down each year below, but think about that. What does it mean? Playing the word association game, focus immediately comes to mind. Something is happening which is leading to a defensive breakdown late in the shot clock, and the trend is significant. Is there a mental breakdown, or is it physical fatigue?